Spending your day splashing and sunning? Well, there’s no need to interrupt the festivities or miss a moment of prime tanning time when Pool Bar & Café has all your refreshment needs covered. Lusciously tropical cocktails, fruit-infused teas and smoothies, sandwiches, appetizers and other irresistible treats are our poolside specialties. Enjoy your selections at one of the al fresco tables featuring gorgeous views of the Gulf waters – or remain comfortably lounging poolside or in your private cabana. From the Hotel Lobby, take the hotel guest elevators to the second floor. Walk into the rotunda and take a left past Actique, the Spa & Salon and Waves. Continue outside to the pool deck. The Pool Bar & Café will be on the left, or east side, of the pool. Exit from the parking garage elevators and take a right through the glass doors onto The Shopping Promenade. Continue to the Hotel Lobby and take a right past The Jewelry Box, and then a right to the hotel guest elevators to the second floor. 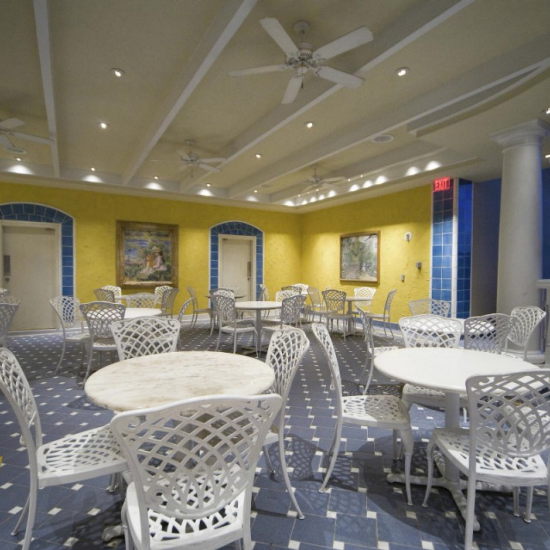 Walk into the rotunda and take a left to the pool deck and the Pool Bar & Café.